'Matinecock Farm' was built circa 1678 by John Underhill Jr. in Lattingtown. 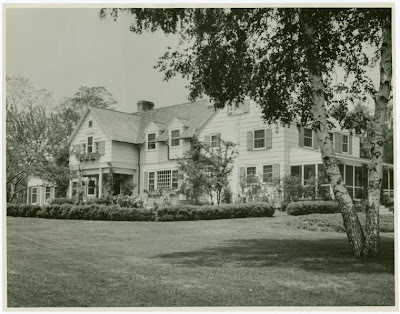 John William Mackay III, the son of Clarence Mackay of 'Harbor Hill', purchased the house in 1957. The house was unfortunately demolished in 2005, but stood HERE, seen on google earth. I can’t believe this beautiful house was torn down as early as 2005! What a kind of local preservation laws does Lattingtown have that would allow some one to tear down a 17th century house? It looks like a great example of that rambling colonial revival architecture of the 20s and 30s- did it possibly have additions are alterations during this period? Thank you for these inspiring pictures. Nassau County has terrible (next to non existent) preservation laws. I would assume it had a fair amount of additions over the years. It is a real shame that it was razed. 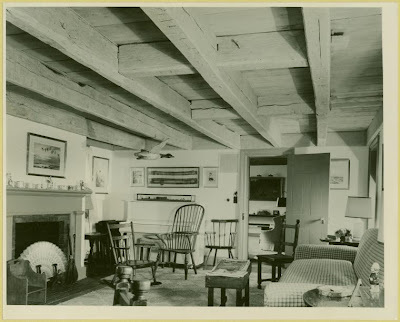 I should add that there are/were a number of examples on LI of late 17th century/early 18th century Quaker farm houses that were expanded over the years to become estate homes. 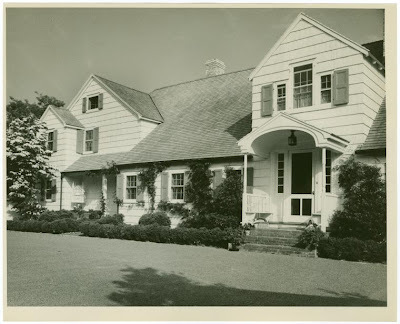 The Hitchcock estate as well as 'Orchard Hill', part of the Jay Phipps estate, both in Old Westbury, are two examples. Its really hard to believe that they could be so behind when the whole of the country has gone preservation crazy in the last decade or so AND they have so much to preserve! Do you know anything about the fate of the Luckenbach house in Old Brookville, is it still in a frozen state of desecration? So incredibly charming, that house. Nothing special, but charming things so rarely are special in many people's eyes. I love it. How different this house was from the mansion that Willie MacKay grew up in at Harbor Hill! I hope he and his wife, Gwen, were happy here. I've read so much about them that I almost feel as if I knew them. Gwen Mackay was a lovely woman - I had the pleasure of knowing and working with her when I worked at Old Westbury Gardens. I hadn't heard that Matinecock Farm was torn down. It's a shame because one of the older portions of the house - which stood on the bank of Factory Pond - was used as a "factory" for producing regimental uniforms during the Revolutionary War. Great website! My Great Aunt was a seamstress to many of the gold coast families from the forties up until the her death in 2008. One day she sent my father and myself on an errand. 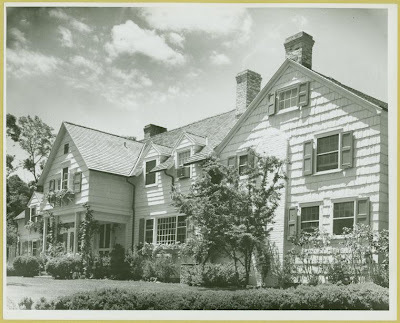 Since we were driving from her house in Westbury to Oyster Bay, she had asked if we would stop in and deliver an article of cltohing which she had mended for Mrs. Mackey. From the moment we stepped in the door I could feel the history those wooden walls held under the low ceilings. You could smell the past. I knew nothing of the house, but I instinctively knew this humble house held a past more significant than any other of the GC mansions I have had the fortune to step into. I did not know its history until I discovered it was torn down and started to investigate its past. NC should be ashamed of itself!